The first accurate 3D map of our galaxy reveals its true shape: warped and twisted. 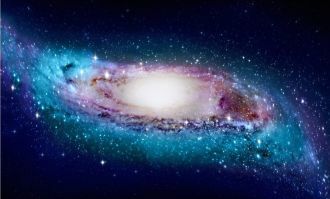 Astronomers from Macquarie University and the Chinese Academy of Sciences have used 1,339 ‘standard’ stars to map the real shape of our home galaxy in a paper published in Nature Astronomy today. They found the Milky Way’s disc of stars becomes increasingly ‘warped’ and twisted the further away the stars are from the galaxy’s centre. Funder: Research support from the National Key Basic Research Program of China 2014CB845700. This work is also supported by the National Natural Science Foundation of China through grants U1631102, 11373010 and 11633005, the Initiative Postdocs Support Program (No. X201600002), the China Postdoctoral Science Foundation (grant 2017M610998) and the National Key Research and Development Program of China (grant 2017YFA0402702). “Somewhat to our surprise, we found that in 3D our collection of 1,339 Cepheid stars and the Milky Way’s gas disc follow each other closely. 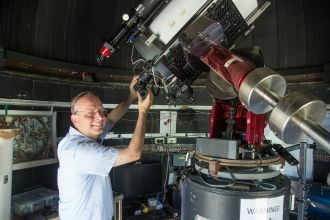 This offers new insights into the formation of our home galaxy,” says Macquarie University’s Professor Richard de Grijs, senior co-author on the paper. 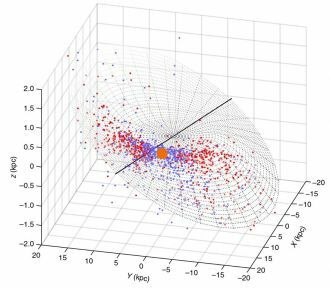 3D distribution of the classical Cepheid variable stars in the Milky Way’s warped disc (red and blue points) centred on the location of the Sun (shown as a large orange symbol). The units ‘kpc’ (kiloparsecs) along the image’s three axes are used by astronomers to indicate distances on galaxy-wide scales. 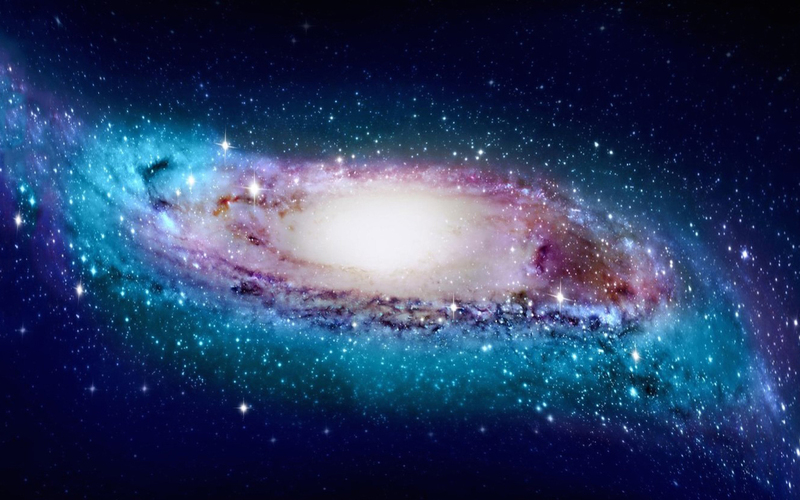 One kiloparsec is equivalent to about 3,262 light years. Video of the 3D distribution of the classical Cepheid variable stars in the Milky Way’s warped disc (red and blue points) centred on the location of the Sun. 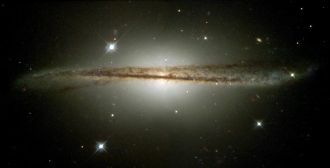 The galaxy ESO 510-G13 is an edge-on warped spiral galaxy. Similar to the Milky Way it has a pronounced warp in its gaseous disc and a less pronounced warp in its disc of stars.